Since prehistoric woman let her prehistoric man dance with her cheek to cheek men have been indulging in the ritual of shaving. Primitive man devised crude instruments with which to cut hair, simple cutting implements such as sharpened flint or oyster shells were used and to this day there are parts of Polynesia where they still use similar objects for cutting hair. See more on the history of shaving. Psychological studies have found ‘women find male faces most attractive when they are masculine-looking but not ultra-masculine.’ Women want dominant males, but ones friendly enough to care for offspring, they tend to see these traits in clean-shaven faces. So a good shave is obviously appealing to many, but although most people expect men to know how to shave properly, many don’t. The days of a father teaching his son the art of how to shave with a razor and getting a close shave are sadly gone for the majority of people. But here at Grooming Health we understand how a face and a shaver can work in harmony, so follow our tips for a good shave and get used to people (and yourself) stroking that smooth as a baby’s botton chin of yours. ° If possible take a hot shower before shaving – If you have the time to take a shower, then this is our top tip and a no brainer. Hot water opens the pores and softens the whiskers. ° Wash the face before you start shaving – Also helps to open the pores of the face and also removes any dirt which might get in the way of the razor, dont forget your face is exposed and takes a lot of abuse throughout the day. Washing with good hot water also lifts the hairs. ° If you’re wet shaving apply the shaving cream in a circular motion – This also helps to lift the whiskers and helps to really work the shaving cream into the hairs of the face. ° Shave the easier areas such as the cheeks first – The easy, flat, and smooth areas are a good place to start shaving as you are much less likely to get any nicks, and this also allows the shaving cream longer to sink into the stubble, softening it and making it easier for the razor to cut through. ° Shave 1st with the grain – When you have finished shaving apply lather again and shave a 2nd time across the grain. For a really close shave re apply lather and shave against the grain. In areas prone to irritation skip this last pass altogether as it can cause discomfort. ° While shaving try to place as little pressure on the razor as possible – If you apply too much pressure when shaving it can cause a very unpleasant razor burn or shaving rash. face with cold water – In the westerns, the cowboys would shave and just wipe off any excess shaving soap with a towel – don’t do it. Give your face a good splashing with cold water, then pat dry, and apply moisturiser or shaving balm to re-hydrate and sooth the skin. ° Between shaves brush the stubble with a fine brush such as a tooth brush – For those of you going for the designer stubble look, make sure you groom it, this makes sure the hair is growing in the right direction and not curling back into the skin. 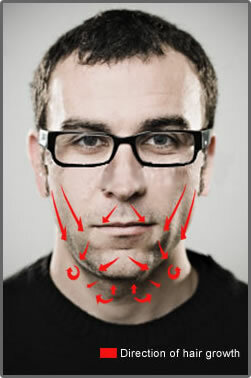 The direction of the faces hair growth is different for everybody and for most people different in difference parts of the face or neck, your face may or may not be similar to the diagram but to achieve a good shave it is important to observe how your whiskers grow and to shave accordingly. Observe the contours of your face divide it into sections so you can shave with the ideal razor angle and the minimum amount of strokes. 1) First it must clean the skin removing any dirt, dead skin cells, oil or other debris that could be blocking the pores and may obstruct your razor, any good face wash or cleanser will do this, also cleaning your face will lift and separate your stubble. 2) The second essential element is to warm your skin opening the pores relaxing your facial muscles, and slightly swelling the hairs. Traditional barbers use a hot towel which they wrap around the face. There is also a few products which offer this treatment these work by reacting with water to warm the skin and soften the hairs. 3) This brings us on to the last and most essential element to a shave prep, to soften the whiskers so your razor can slice easily through the stubble. There is a number of products that do this by penetrating the hair follicle and moisturising it, another method is simply soaking your face with hot water. However the most highly recommended advice we can give is a hot shower, this can combines all the essential elements of a good shave prep. Also don’t shave immediately after getting out of bed as your face will be a little puffy. Some people use hair conditioner as a shave prep to soften the whiskers, however most conditioners sit on the hair as appose to sinking into the follicles so it is debatable whether they would provide any help in regards to shaving.